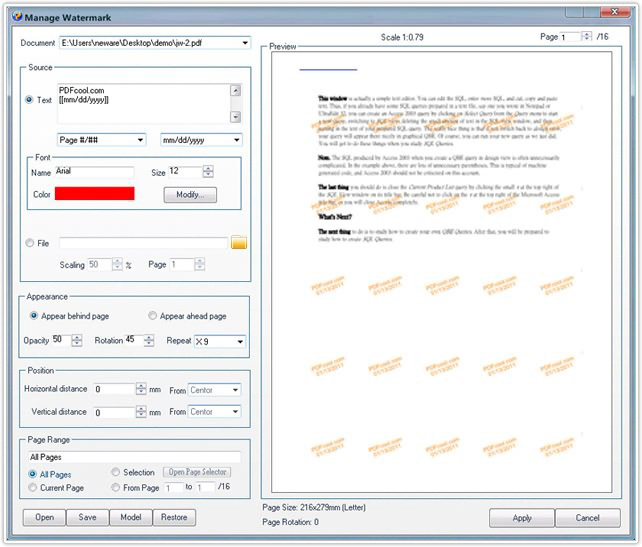 The PDFCool Studio watermark tool allows the user to quickly add text or image watermarks to one or more pages in a PDF document. You have full control over the position, size, opacity, and more of your watermarks, and you can save them as project files for reuse. 7. Click on the Apply button to finish. By click on the Open, Save, Restore or Model buttons lactated in the bottom left corner, the user can choose to open the watermark project files, save the current options as project file, back to the default options, or choose a watermark model provided by PDFCool team.